Preheat the oven to 400°F. Salt and pepper the chicken cavity; stuff with half the tarragon and the lemon (cut into thick slices; squeeze the slices as you put them in). Tie the ends of the drumsticks together with twine and brush the whole chicken with melted butter. Then generously sprinkle with salt. Place the chicken breast-up in a roasting pan and roast in the oven for 30 minutes. Add the mushrooms and wine. Brush the chicken with whipping cream (2 to 3 tablespoons at a time) every 5 minutes for the next half hour, until the internal temperature reaches 150°F; remove the chicken from the oven and let rest, covered with foil, for 15 minutes. Remove foil from chicken and carve; place onto a large, warm serving platter. Arrange caramelized apples at either end of the platter. Check if the sauce needs more salt and pepper; add the Calvados and the remaining tarragon leaves to the sauce. Drizzle half the sauce over the chicken pieces and serve the rest in a sauce boat. Garnish the platter with sprigs of watercress. 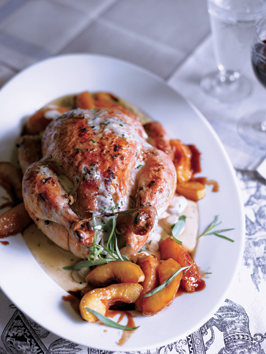 Note from Chef Jacques Boiroux: At home a ‘Pomme de Terre Purée’ mashed potato always accompanied this fabulous chicken to mop up the sauce.